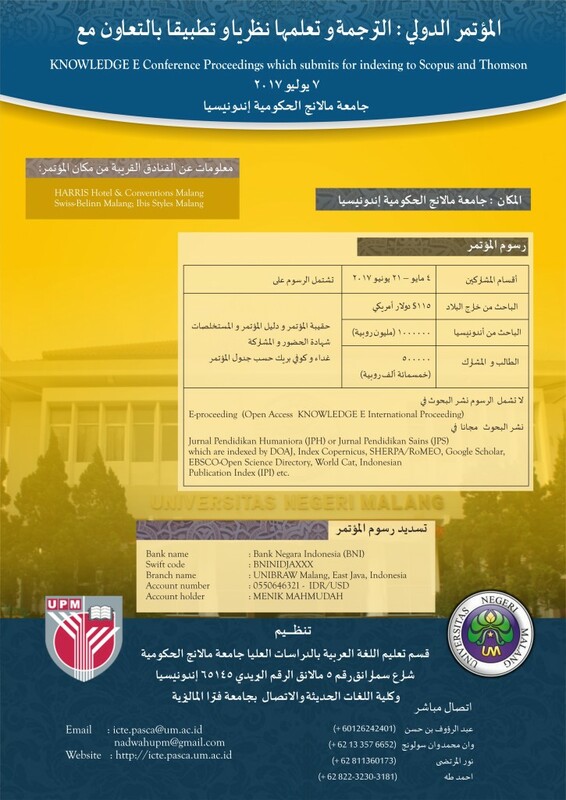 In the attempt to become a world-class university, Universitas Negeri Malang, in the first time of more than its six-decade history, has decided to confer Doctor Honoris Causa to Dr. Abdullah al-Wasymi, the Secretary General of King Abdullah bin Abdul Aziz International Center for the Arabic Language, Riyad Kingdom of Saudi Arabia. This memorable academic event will take place in July 2017, along with an International Conference on Translation in Education, with a major theme Translation in Education with Cross-cultural Orientation. Translation, which carries over a message from one language to another, serves among other things to bridge the gap between two cultures. Indonesia and Saudi Arabia, each with its own national language, very probably have similarities and differences in cultural conventions; and so do other countries with different national languages. As for the focus on Education, part of Universitas Negeri Malang’s major mission is to produce professional teachers and lecturers in more than twenty subfields of science. Moreover, educational practices in each country always bring along its national culture as well as its local sub-cultures, albeit subconsciously. 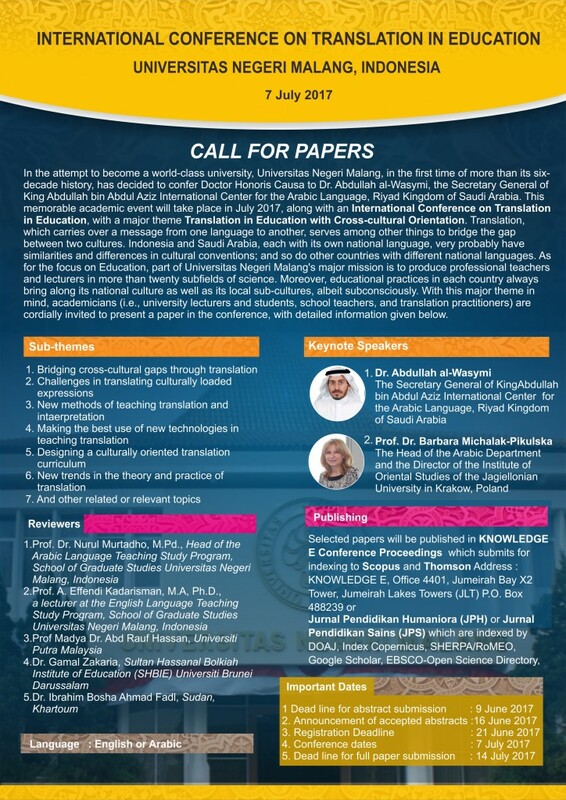 With this major theme in mind, academicians (i.e., university lecturers and students, school teachers, and translation practitioners) are cordially invited to present a paper in the conference, with detailed information given below. Jurnal Pendidikan Humaniora (JPH) or Jurnal Pendidikan Sains (JPS) which are indexed by DOAJ, Index Copernicus, SHERPA/RoMEO, Google Scholar, EBSCO-Open Science Directory, World Cat, and Indonesian Publication Index (IPI).